My question, Should I add another flag as well?, is from the 23rd, and I don't think any changes were made. Additionally, there were no extra upvotes on it (although I don't think this bumps questions - correct me if I'm wrong); I know this because I'd already received the "Nice Question" badge on the 27th. Why do old questions occasionally "float to the surface" again? If there are still under 4 items, the rest of the space is filled with hot discussion questions not marked status-completed, scoring at least 3 and posted within the past two weeks. These are picked semi-randomly. At least one of these will always be added to the list, even if it pushes the length over 4. The list refreshes every 20 minutes or so, and since qualifying meta questions are selected randomly it's not uncommon to see questions pop in and out of the list as chance dictates. Not the answer you're looking for? 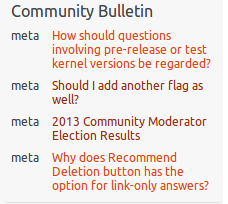 Browse other questions tagged support community-bulletin . When does the community user start bumping old questions? Can I migrate some questions of mine from Superuser to here?